The Joseph and Rose Kennedy Institute of Ethics (KIE) was founded in October 1971, "as a center for research, teaching, and public service," according to the Institute’s very first newsletter. The newsletter was first introduced in the summer of 1974, three years after the Institute was founded. The quarterly publication served as a method to inform, acknowledge, and demonstrate the interdisciplinary approach that was being taken by the Institute as it explored the relatively new world of what would become the field of bioethics. 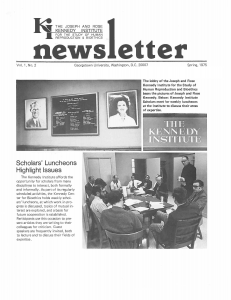 As the years progressed and the Institute evolved, these newsletters were instrumental in capturing the changes as new scholars and new initiatives were being put in place. These documents, without explicitly meaning to, left a record of those changes and provide a valuable lens by which to explore the history of the KIE and bioethics as a whole. You may leave feedback regarding this collection at the Bioethics Research Library's KIE Newsletters Archive page.